Cosy and comfortable apartments, garden with sunbathing lawn, barbecue facilities and playground, car parking, shops in the surrounding area. Welcome to Residence Kiem in Latsch! 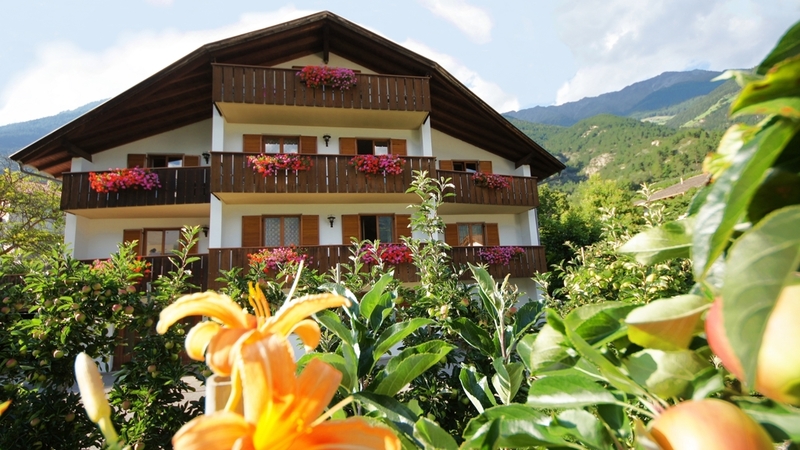 The vacation apartments are located in Latsch in Vinschgau, the West of South Tyrol, embedded in the nature. Due to the quite surroundings and plentiful sunshine pure relaxation awaits you – perfect for a family holiday in South Tyrol’s mountains. All vacation apartments are for 2 or 4 persons and equipped with cooking facilities, TV, shower, WC and balcony. The lawn of sunbathing in the well-tended garden, the barbecue and a playground with sandbox and swings, offers an ideal opportunity for relaxation and entertainment. The guests will find parking space on the yard. Shopping possibilities are just a few minutes’ walk away from the Residence Kiem, in the small village Goldrain. The position of the building makes it to a perfect starting point for rambles and bike tours through the beautiful and varied nature of Vinschgau. The Kiem Family is looking forward to your visit!